When she discovers the mutilated body of the revivalist preacher and her brother, Viktor, laid out in ritualistic style, on the floor of 'The Source of All Our Strength' church, Sanna turns to her old friend Rebecka Martinsson for support. Despite her onerous work schedule as a tax lawyer in a large, very demanding law practice in Stockholm, and her reservations about her own past in connection with the church, Rebecka heads back to the small town and community to help. The chief prosecutor on the case seems to have already decided that Sanna is guilty and she is charged after vital evidence is found hidden in her home. Rebecka reluctantly finds herself trying to provide legal and emotional support to the emotionally fragile Sanna as well as care for her friend's two daughters and keep everyone safe. Inspector Anna-Maria Mella shares Rebecka's doubts over Sanna's guilt and despite her own very advanced pregnancy, stays working on the case right up to the birth of her own baby. There's a very dark, subdued aura hanging over SUN STORM. The setting is freezing, snowed-in small-town Sweden. The atmosphere around the church is equally dark and foreboding. The relationship between Rebecka and Sanna is difficult, each has some past baggage resulting from joint and separate experiences of the church, which tore them apart and turned Rebecka into an outcast from the community years ago. 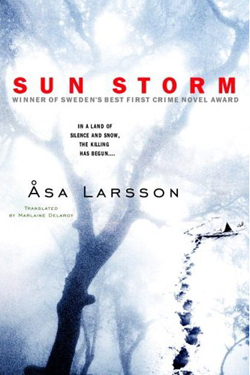 The interesting thing about SUN STORM is the strength of the writing and the story being told. The two central characters, Sanna and Rebecka are equally unsympathetic, almost unlikeable. Despite that, they are engaging and you are kept reading to find out the truth of what is really going on. The atmosphere is oppressive, sad, everyone seems to be damaged, troubled, unhappy or questioning, and yet the reader is pulled through the story. As a card carrying member of the "dead people: fine, harmed animals: bad" sector of crime fiction fans, even the albeit brief and off-camera fate of an engaging pet dog, whilst shocking, is probably more distressing because of the reactions of the central characters. An intriguing and ambiguous ending is the perfect finish for a story in which characters are living lives that are real, complicated, challenging and raw. Highly recommended for readers who like their fiction to challenge them, make them think and don't mind the story staying with them way after the book itself has gone. Read another review of SUN STORM published as THE SAVAGE ALTAR in the UK.